Tips when purchasing/learning to ride your first Motorcycle or Motorscooter . One of the first things to do is get along to your friendly nearby Motorcycle dealer and look, not just for the bike that you like the look of but how the seat height feels. Pop your backside on the seat and see if your feet touch the ground comfortably. This is so important because when you have your feet planted securely on the ground your confidence gets a boost. When you have to stop (and you will) you can reach the ground quickly and safely. From my experience when you stop, put your foot down and you don't reach the ground... well, you know what I mean - over we go. Safe and enjoyable motorcycling is about good balance and with that you have a good basis to start learning to ride. Secondly the feeling of putting your foot down on a pebble or two will give you the sensation of wearing rollerblades instead of a good safe motorcycle boot. This catches out even experienced riders. The second tip to consider is what you want to use the Motorcycle for, i.e. if it's just for small commuting then it probably is not worth looking at anything much over 250cc. I say this because it is great to get your first impressions of motorcycling on something that is light and easy to manoeuvre when you are on the bike or off it. It is more confidence building rather than launching into something bigger and faster and heavier. This will depend on the person and their abilities. The third tip is when you've found the bike that you feel will suit you, then go sit on it and check out all the buttons, dials, switches, levers, etc. Ask your salesperson lots of questions and get familiar with the bike and all the things it can do and cannot do. This will be a great help to you when you take your first lessons or first ride. Knowing where everything is will automatically help you keep concentration on the road ahead. Every second you take your eyes off the road is a chance another object on the road may require your attention, e.g. a vehicle pulling out of a driveway or a pothole in the road, etc. the bike and its balance point, providing it's not too heavy for you to handle. Also a walk around the bike while it's on its side or centre stand is helpful. It's a good opportunity to practise getting the bike off and onto its centre stand, if one is provided. When putting the bike on its side stand be sure to push it forward firmly with your foot. Fifth tip.Get yourself some good quality Safety Motorcycle gear. Some suggested websites to visit are on the Clothing page. Motorcycle Jacket, Pants, Boots, and Gloves. Check out the ranges available at your local motorcycle store or online. Safety is No.1 when riding a Motorcycle or Motorscooter. There are many more accessories well worth the investment like a Hi-Vis over jacket etc. If you are looking at second hand gear Trademe New Zealand is a good place to check out if you live in New Zealand. 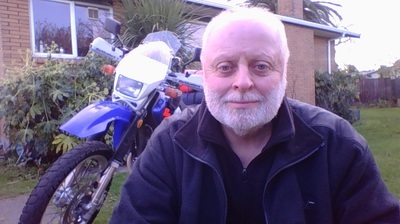 When you have the motorcycle of your choice (and if you are new to motorcycling and have done a riding/training course) then it's time to start doing some rides. I suggest a few small rides and when your confidence is at a level you can do all that is required to safely ride, then set yourself a longer trip. Say maybe 2 to 3 hours all up. Going with a more experienced safe rider is a good idea. This is the best way to up your riding skills. It allows you to become very familiar with the bike, the traffic and all road conditions. I have done this with many a new rider and all say they are more confident after a long trip and enjoyed the freedom that is part of enjoying motorcycle riding. White or yellow painted lines on the road can be very slippery so when you cannot avoid riding over them, slow down if possible, and try to ride over them with the bike as upright as possible. If the bike does start a wee slide try to avoid the temptation to back the throttle off too quickly as this generally tends to make the bike want to sit up and a possible highside experience may happen. This is a simplified description, but hopefully you were taught this in more depth on a motorcycle training course. Keeping a good distance between you and the cars and other traffic is a wise thing to do. It means you have more time to react. Patches of diesel from diesel trucks and cars can appear on the road in rain or drizzle as a rainbow colour and usually shiny and they can be very slippery. Manholes and steel culverts on the road can be very slippery in the wet. Try to avoid them.